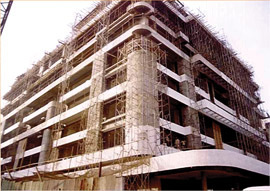 Versatility of Concrete is an established fact on account of its mouldability and durability. This makes it attractive for use in varied exposure conditions. Vulnerability of concrete to deterioration has always been a cause of deep concern. Concrete Cover plays a key role in this phenomenon. Generally, the process of deterioration begins almost immediately after the casting. Basically from material science point of view, the durability of concrete structure is a direct function of achieving specified cover not only in dimensions but also in quality. Considering a mix of complicated construction, quick completion deadlines, speed of construction and economy, it becomes virtually impossible to cast specified cover to reinforcement. The outermost layer of concrete therefore becomes the weakest one. If formworks are not impermeable and slump of concrete is not adequate, the cement paste does not cover the reinforcement optimally to render it passive to corrosion. This facilitates deterioration and the subsequent need for repairs. Since cover is the first line of defense to inhibit corrosion, repair and rehabilitation is recreation of cover with the highest protection quotient. We therefore need to use the latest technologies like polymers, fibres, etc. to lower the permeability, minimize the cracks and provide adequate bonding, to stop further deterioration. Given actual working conditions, it is difficult to create a cover that will be resistant to carbonation or chloride ingress. To remove this lacuna from the system, it is preferable to resort to protective coating that work on principles to equivalent cover to ensure durability of repairs. 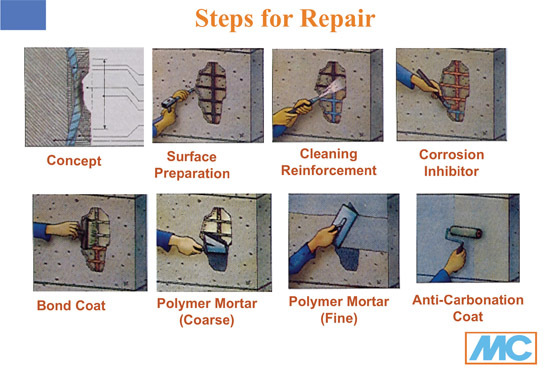 Therefore, the last step of Concrete Repair, which is anti- carbonation or chloride ingress resistant coating, ensures the durability of Repairs. It has been established that the increasing environmental stress is one of the key factors causing concrete damage. Figure 1 shows this process, due to carbonation attack. It is recognized that steel embedded in a heavily alkaline medium like concrete with pH-values from 9 upwards will not rust. 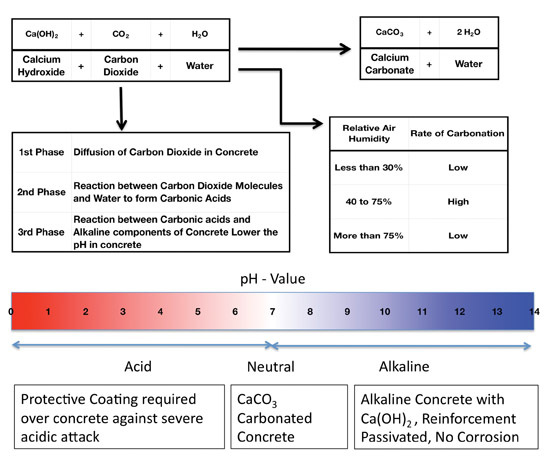 The concrete’s hydration process ensures the concrete’s alkalinity, producing a pH-value of more than 12.6, which renders the steel surface passive to corrosion. Due to this, even the occurrence of small cracks (up to 0.1 mm in width) or blemishes in the concrete need not necessarily lead to damage. Environmental influences and carbon dioxide in particular, will reduce the concrete’s pH-value (carbonation) and will remove the passivating effect. In conjunction with existing humidity, the result is corrosion of the reinforcement. Defects and damage occurring in concrete structures can be ascribed to varying causes, which frequently overlap. European Standard EN 1504 provides an excellent guideline summary of possible causes of concrete deterioration. The first points emphasized in the statistical record of causes of damage are poor workmanship on the part of the concrete producer and environmental stress. With regard to poor workmanship, the principal factors concerned here are an excessive water/cement ratio, defective concrete cover and defective curing. Taking these factors into consideration, specifiers should issue more stringent guidelines in respect of concrete cover. It has become widely accepted in specialist circles that particular importance should be attributed to sufficient curing of the concrete with a view to ensuring its durability. These new developments will considerably improve the durability of newly erected concrete structures, though they do not of course affect the quality of already completed concrete buildings, which is the majority of our infrastructure. Other factors, of course include higher mechanical, chemical, thermal and biological loads. When a structure shows signs of distress or deterioration, the following steps should be taken in principle. The condition survey is to be conducted and the field investigations are to be done. The steps are as under:Preliminary Investigation, detailed Investigation, Diagnosis, Laying out specifications for repairs, Selection of Materials, Surface Preparations, Actual Repairs, Periodical maintenance, Mainten- ance of Reports etc. for future repairs. Long years of experience, professional competence and technical equipment for assessment of defects, damage and for establishment of repair measures. 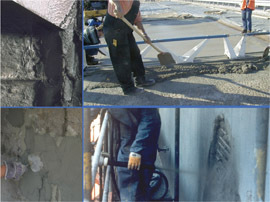 Depending on environmental or structural stress concerned and on extent of damage, protective and repair system adapted to the structure in question and involving suitable and reliable products for the repair of concrete structures will be recommended from a range of successfully tested and established materials. Experienced professional firms who are thoroughly familiar with the material concerned should only carry out protective and repair work. For these reason, MC passes on the experience and knowledge of its staff to professional applicators. The company will advise such firms before and during the performance of repair work. A well-established repair system for concrete structures in building construction is described in detail below. Hints are also given on alternatives frequently required due to conditions at the structures in question. 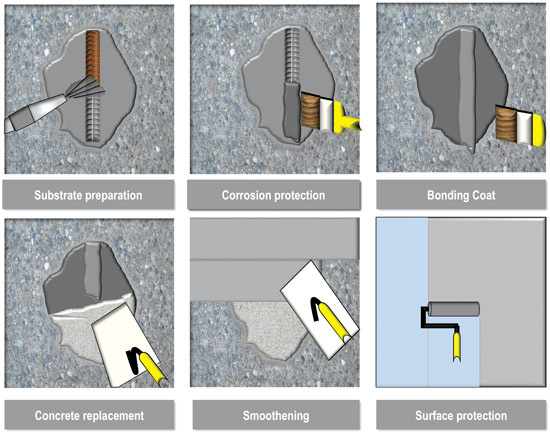 In Brief, Figure 3 shows the procedure of effective concrete repair. The steps are discussed in detail below. Surface Preparation: The existing base must be firm & stable and free from oils, and fats, impurities of all kind including form/mould oil residues which must be removed along with any cement laitance. Sandblasting or wire brushing are effective water-free methods to clean reinforcement. Use of acidic rust removers and water is not recommended to protect the reinforcement from further corrosion. The base should be lightly moistened before commencing work and should be slightly damp but still absorbent and never saturated with water. Protection of Exposed Reinforcement: All exposed reinforcement cleaned to bare metal must be protected immediately after sandblasting by using Zentrifix KMH – polymer modified one component corrosion inhibitor and bond coat. In harsher conditions, a zinc rich material like MC-DUR ZKE can be used. Treatment of Cracks: The sealing of cracks in concrete is a special measure in itself, which becomes absolutely essential in the event of the following widths of cracks: More than 0.3 mm in dry areas/rooms or More than 0.2 mm on buildings in the open or More than 0.1 mm where the structure has a high corrosion risk. Low-viscosity epoxy-resins likeMC-DUR 1264 can be used to treat fine cracks. MC-DUR 1264 produces a structurally perfect bond in the case of non-moving cracks. For bigger cracks Centricretemineral injection grout is also available. This injection must be carried out before application of the final treatment. 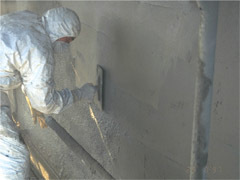 Concrete PCC Repair: All defective areas to be filled are first pre-treated with a bond coat. Zentrifix KMH or a mixture of Zentrifix dry mortar and a mixing liquid consisting of a polymer component, Nafufill BB 2/ Nafufill SBR and water can be used. This mixing liquid is added to the dry mortar until a grouting consistency is achieved. The resultant grout is then thoroughly brushed into the base. While the adhesive bond is still fresh, Zentrifix repair mortar is applied to it wet on wet. The Zentrifix repair, mortar can also be improve with the polymer component Nafufill BB 2/ Nafufill SBR in order to ensure good adhesion to the base, to prevent shrinkage cracking and to improve resistance to temperature changes. Where conditions on site make it impossible to work wet on wet, a scud coat of suitable composition can also be applied as adhesive bond. Zentrifix mortars are applied in one operation at repair depths up to 25mm, and in several layers where such depths exceed 25mm. The fine filling described in detail below can be applied after a gap of at least 12 hours. For larger honey combs and jacketing purposes ready to use, high strength micro concretes like Emcekrete/ Expacrete/ Emcekrete Type Acan be used. Fine Filling: To achieve a visually uniform surface and to provide additional preventive protection the repaired concrete surface should be fine-filled. This is done with a fine dry-mortar, concrete cosmetic Zentrifix FF 02/ Nafuquick, and a mixing liquid composed of water and or the polymer component Nafufill BB 2. Depending on the structure involved, it can be used in overhead work or as a fine-filler under elastic, crack-bridging systems. Impregnation to provide Hydrophobic Qualities: As an additional, protective measure, particularly in the case of porous substrates susceptible to fractures (e.g light weight concrete), a hydrophobic impregnation agent can be applied up to saturation point to the surfaces first treated by a fine finish, using Emcephob SX/ Emcephob AC etc. This impregnation will ensure that there will be no infiltration leading to more extensive damage if hairline cracks from or if the surface protection is subjected to mechanical damage. Concrete Surface Protection, Carbonation inhibitor, Coloured finishes: On completion of the work described above, the entire concrete surface must be provided with a final seal or final coating. This is mandatory to maintain status quo of corrosion. Such surface treatments perform several duties at the one time. Firstly, all the concrete is protected from further stress due to aggressive pollutants in the air and from progressive carbonation. These coating systems must have to a high CO2 resistance if they are to be effective in protecting against carbonation and, on the other hand, they must not have a negative effect on the buildings water vapor diffusion rate. 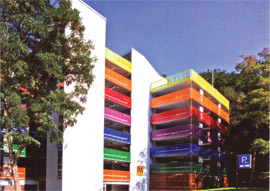 The Emcecolorflex/Betonflair protective system has proved itself to be particularly suitable for this purpose. Systems on a Two- component Epoxy/ PU Resin Base: Systems based on MC-DUR reaction resins have proven to be best for structures subjected to severe chemical stress-e.g in production areas, water clarification plant, factory floors, multi-storey car parks and many other structures. It should be noted here that systems of this kind, based on two-component reaction resins, show a thermal expansion behavior different from that of concrete. Allowance must be made for this fact in the repair of structures in the open air and of objects exposed to severe stress from changes in the repair of structures in the open air and of objects exposed to severe stress from changes in temperature. MC-DUR resin systems provide important additional properties in comparison with systems bases on hydraulic binding agents – particularly where chemical or mechanical load is severe. Corrosion damage to the reinforcement in concrete and the resultant spalling of sections of concrete along with other concrete surface damage is far more serious than being just an eye-sore: it constitutes a serious risk to the useful life of the concrete structure and even become a danger to occupants and passer-by. The guidelines provided above indicate possible ways of providing reliable repair with well-established products and systems. MC products for the repair of concrete structures have proven themselves in practice for more than 20 years in Indian conditions, and many buildings and structures can now be referred to as evidence of their quality.In addition to quality of the repair material, professional handling of these materials and a knowledge of concrete technology, construction physics and their inter relationships on the part of those applying the treatment is of decisive importance. It is therefore essential to reserve the execution of concrete repairs solely to experienced and trained professional firms. It has also been shown that, besides careful execution and observation of all specifications relating to the durability of concrete structures, preventive protection can provide added assurance. Particularly worthy of note in this connection is curing of the fresh concrete with products which will provide long-term protection against CO2 and other air pollutants, thus preventing carbonation of the concrete surface. 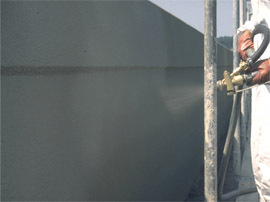 Reference is also made to proven protective systems for structures especially at risk, like the Emcephob System for preventive protection, Emcecolorflex/ Betonflair for anti- carbonation coats and the various MC-DUR liquid plastics for protection of concrete corrosive materials, acids, salts, and other chemical effects-severe chemical attack. MC’s technicians are always ready to advise in expert appraisal of a particular structure and in the selection of suitable means of protection. Mr. Samir Surlaker is a Civil and Structural Engineer from VJTI with over 30 years of National and International experience and exposure in Construction Chemicals, Rehabilitation Strategies, Injection Systems etc Germany, Europe, Middle East and India. He is currently the Managing Director of MC-Bauchemie (India) Pvt Ltd, a joint venture with MC-Bauchemie, Germany manufacturing over 100 construction chemicals. Sunny Surlaker passed his B.E. in Civil Engineering from VJTI Mumbai in 2005 and also holds a Masters in Civil Engineering from University of Michigan, Ann Arbor, USA. He is currently the Head of Admixture Division with MC-Bauchemie India Private Limited a joint venture with MC-Bauchemie, Germany manufacturing over 100 construction chemicals. He has also worked extensively in Germany and Brazil with MC-Bauchemie. Before that he was a Material Specialist with the Global Multinational AMEC Earth and Environmental, in Phoenix, Arizona, USA. Posted on Sun, Mar 4th, 2012, in Civil Engineering. Bookmark the permalink. 7 Comments. Hi fantastic website! Does running a blog like this require a lot of work?